American Gen. David Petraeus formally assumes command of the 130,000-strong international force in Afghanistan. American Gen. David Petraeus formally assumed command Sunday of the 130,000-strong international force in Afghanistan. U.S. Gen. David Petraeus, the new commander of U.S. and NATO forces in Afghanistan, speaks Saturday at pre-Independence Day celebrations at the U.S. Embassy in Kabul. ((Dusan Vranic/Associated Press))Petraeus called for troops and civilian staff employees to work together. "In this important endeavour, co-operation is not optional," he said. Petraeus's predecessor, U.S. Gen. Stanley McChrystal, was fired last month for intemperate remarks he and his aides made to Rolling Stone magazine about Obama administration officials, mostly on the civilian side. 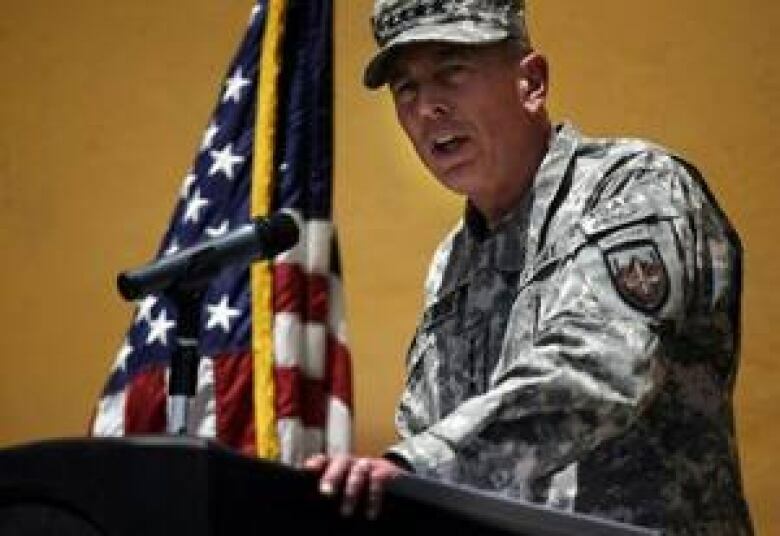 On Saturday, Petraeus spoke to about 1,700 invited guests, including Afghan government and military and police officials, gathered at the U.S. Embassy in Kabul for a pre-Fourth of July celebration. "Civilian and military, Afghan and international, we are part of one team with one mission," he said, making his first public comments since arriving Friday night. During the picnic, NATO issued a statement acknowledging the deaths Friday of two Afghan civilians, including a woman, in a joint raid with Afghan troops to arrest a Taliban deputy commander in the Kandahar area. During the raid, an Afghan man left a compound and "demonstrated hostile intent," NATO said. Troops opened fire, wounding him. When troops entered the compound, they found an Afghan woman dead from stray bullets and another man wounded, NATO said. One of the two wounded men later died.